ERR provides emergency repair or replacement of heating systems for Energy Assistance clients. Be approved for energy assistance. The application and income guidelines can be found here. Own your home. For proof of home ownerships questions, please see the ERR FAQs. Have a non-functioning heating system. If you are eligible for this program and have a no-heat situation due to problems with your furnace, boiler or other heating system, please call us. We can only pay for repairs authorized by MVAC first. 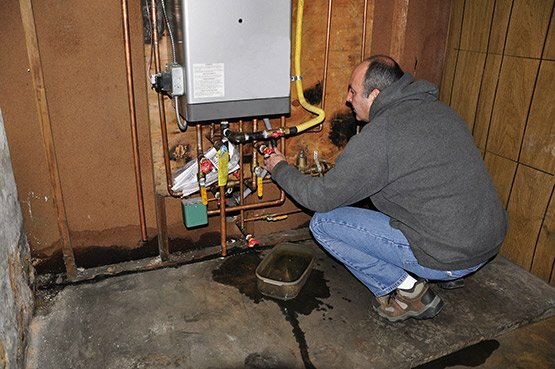 To contact MVAC about problems with your heating system, please call (507) 345-6822. If you have a no-heat emergency on the weekend, please call MVAC (800) 767-7139. For more information on the Energy Related Repair Program please see our FAQs below. For more heating systems and energy saving tips please see our Other Resources. Am I eligible for help with my furnace through ERR? To be eligible for ERR you must be approved for Energy Assistance, own your home and have an emergency heating situation. How can I prove I own my home? A property tax statement, mortgage statement, copy of your title (for mobile homes) or information from the county recorder or assessor can be used as proof of your home ownership. I am buying my home contract for deed. Can you help me with my furnace problem? Yes, contract for deed is considered home ownership. You may be required to submit a copy of the contract for deed documents. I don′t need help with my bills, just my furnace. Do I have to fill out the application? Yes, you must be approved for Energy Assistance before we can help with a furnace problem. I had my furnace repaired last week. Can you help me with the bill? No, all repairs must first be authorized by Minnesota Valley Action Council. Nothing, repairs and replacements are paid for through the ERR Program. Who will you send to work on my furnace? We work with licensed heating contractors from all over the area. If there is a specific contractor you would like to work with, we will try to make accommodations. The gas company shut off my furnace. What should I do? Contact us immediately and we will arrange for a contractor to do the repair or replacement. Please save a copy of the tag so we can include it in your file. My furnace stopped working. Is there anything I can check before calling? Please check your fuse box and try changing your furnace filter. One of these is often the source of the problem. Can you help me replace my water heater? No, ERR only assists with heating systems. Can you help me with my air conditioner? No, ERR is a program to assist with no-heat situations only. My furnace is really old. Can you replace it? No, ERR is for no-heat and health and safety situations only. If your furnace is old but still works, we cannot assist, but keep our number handy just in case it stops working. My furnace needs a clean and tune. Can you pay for it? No, ERR is for emergency situations only. We cannot pay for clean and tunes and other general maintenance. My furnace went out over the weekend. What should I do? Someone from our office is available for no-heat emergencies on weekends between October 1st and May 31st. Please call (800) 767-7139 for assistance. When does the ERR program start? Because our funding comes through the federal government, we don’t know exactly when we can start authorizing furnace projects. It generally begins sometime after October 1st and runs through May 31st. If you have a furnace problem, please call and we will add you to the waiting list. I received Energy Assistance and my furnace isn′t working. Can you guarantee there will be money available to fix it? No, unfortunately our funding may be limited and furnace projects are done on a first come, first served basis. We recommend submitting your application as soon as possible to increase your chances of receiving assistance.